Looking to know the family behind the company? 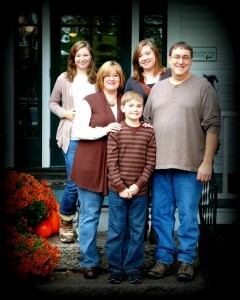 Here we are… the Clements! We love living in the Valley! There’s just something wonderful about community, and the connectedness we have experienced in our beautiful home town is no exception. We love that because of the close-knit feel of this place, the people our business serves quickly go from clients to being called friends. It’s not odd to find Joel dispensing technical advice in the bread aisle of the grocery store, or to see us enjoying the concert in Schouler Park on the Fourth of July next to the people we work with on a weekly basis. That’s what community is all about. Serving each other, however we can. Joel is computer technician extraordinaire, while Heather works behind the scenes (you can also find her working at M&M Assurance Group as the Director of Marketing). Chances are you’ll bump into one or more of the kids if you swing by the house to drop off your computer. We think they’re some of the friendliest young people we’ve ever known, and we bet you’ll agree.